It stood once for the ambition and poise of a young nation emerging from colonial rule, stretching its wings. Today it stands abandoned, prey to the elements after years of neglect, its fate hanging in the balance. Demolition is a likely option. "The building is on life-support," says Sahbi Gorgy, a Tunisian architect involved in drawing up plans for the site on behalf of its Libyan owners. "The hotel is a unique witness to a certain age," Mohamed Zitouni, a Tunis-based architect involved in the preservation campaign, told the BBC. 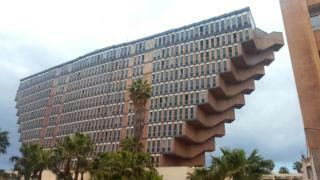 "It's one of the rare buildings after Tunisian independence that shows vision and maturity." The desert locations that appeared in Star Wars have been preserved as tourist attractions. But can "the Force" also save a Brutalist hotel from demolition? Mr Zitouni subsequently told the BBC's Focus on Africa radio programme that Lucas had seen the building when he first visited Tunis, and was "inspired to draw, or design, a kind of sand tank… very similar to the shape of the Hotel du Lac". A key crew member from the original Star Wars, contacted to see if there was indeed a link between the building and the tank-like vehicle, conceded that they did look "kind of similar". But Roger Christian, the British director and set designer who won an Academy Award for his production design on Star Wars, believes any link would be "tenuous" at best. Christian told the BBC the Sandcrawler owed its look to Ralph McQuarrie, the legendary US concept artist who shaped the aesthetic of all the films in the original Star Wars trilogy. Lucas enlisted McQuarrie early in the film-making process, while he was still writing the script, to illustrate his ideas. "Ralph did some beautiful drawings, and the Sandcrawler was drawn up pretty much as it is," Christian says. In the 1950s, he had served in the US military in Korea, and the look and feel of army equipment - bulky vehicles, sleek weapons - can be seen in the machinery in Star Wars. During filming in the Tunisian desert, the model Sandcrawler was, in fact, mistaken for military hardware by a group of Algerian soldiers who were just across the border. "They saw this name, Star Wars, and they thought we were building a war machine," Christian says. "They had to come over and verify that it was a film set." After the Korean war, McQuarrie made a living as a technical artist. He produced animation to accompany TV coverage of Nasa's Apollo missions, and he worked for Boeing, producing the manual for assembling the new 747 jumbo jet. It was this apprenticeship, as a sort of master draughtsman of the US aerospace sector, that made McQuarrie's fighting machines of the future so compelling. His Star Wars artwork is like an advanced projection of US technological might - a space race that has outgrown its terrestrial rivalry. Bateman says the idea for the Sandcrawler's massive tank-like treads came from the Nasa Crawler Transporter, a colossal tracked vehicle that lugged the Apollo programme's Saturn rockets to their launch site. By far the biggest influence on McQuarrie's art, however, was the pulp sci-fi of the 1930s through to the 1950s. According to Bateman, the idea for the Sandcrawler's hull-like shape arose from sci-fi tropes of sand-ships and ships of the desert, and evolved into something that "quite literally resembled a ship". "This was the prime time of the space age, so everything seemed possible," says Felix Torkar, an architectural historian who helps run the #SOSBrutalism campaign. "Daring, futuristic architectural designs were also very much of that time." A typical Brutalist building, he says, might look visionary and simultaneously have a raw, monumental quality - "like the ancient ruins of a forgotten space-faring civilisation". The heyday of Brutalism, from the 1950s to the 1970s, coincided with the process of decolonisation in Africa. Leading Brutalist architects were commissioned for many grand projects - museums, universities, hotels - in the newly liberated nations. Across the continent, dramatic concrete structures were erected to symbolise modernity and an international outlook. Mr Torkar says Brutalist buildings tended to obey three basic rules - "expose the materials, expose the structure, and make it a unique, memorable design". In Tunis, the upside-down shape offered an elegant solution to problems with the site. As the ground was unstable, the foundations of the building had to be specially constructed - a laborious process. But the hotel's form minimised its footprint, which meant that the foundations would not have to be particularly wide, as long as they were sufficiently deep. Tunisia's hotel sector was developed after independence to attract foreign visitors. Revenues from tourism have helped power the economy, accounting for some 8% of the GDP. But the number of foreign visitors plummeted after a series of terror attacks at tourist sites in 2015, and the sector is struggling to recover. Brutalism had emerged from the wreckage of war and empire to provide a global house style for the public sector. It was chosen by governments worldwide to express a radical ideal - that the elected representatives of the people should use public funds to provide buildings for the use of the people. In the last decades of the 20th Century, that ideal would fall out of favour, and its concrete forms would fall into ruin. Tellingly, the films of the time that are clearly influenced by Brutalism - Blade Runner, Alien, A Clockwork Orange - tend to portray bleak, dystopian futures. The Sandcrawler, though not inspired by a building, would end up inspiring a building. In 2013, the film company founded by Lucas opened an office in Singapore that shared the vehicle's name and echoed its shape. Swathed in glass, it is in no way a Brutalist structure. In 2015, Fortune magazine estimated the worth of the franchise since its inception, including earnings from box office, home entertainment and merchandise. The total figure came to $42bn (£32bn) - just $1bn less than Tunisia's GDP in that year.